Full crowns, on the other hand, do not guarantee of being a superior restoration or with fewer complications. It has been estimated that the 10 years risk for biological failures in conventional full-coverage-fixed partial dentures (FPD) such as caries and loss of abutment vitality is close to 9.5% and 10%, respectively, and nearly 2.6% of FPD's were lost due to caries. Failure of full-coverage FPD due to mechanical complication (loss of retention) is estimated to be 6.4% over a period of 10 years.,, Long-term studies on clinical success of partial veneer crowns are limited in literature. A study on clinical performance of conventional partial veneer crowns showed that the failure rate was close to 20%, mainly attributed to loss of retention and to a very lesser extent caries. No loss of vitality was reported. This is very close to the survival rates of resin bonded retainers as reported in various studies.,,, Failure rates of partial veneer crowns are more than full crowns and are mostly due to debonding of the prosthesis. Partial veneer crowns are still clinically unpredictable, and hence, a there is a shift towards more predictable full crowns. Thus, a satisfactory restoration which employs principles of sound engineering and down-to-earth conservation can avoid the indiscriminate use of full coverage. In this study, we wanted to explore the potential of these two new surface treatment modalities (laser etching and spark erosion) for improving the longevity of partial veneer crowns. The aim of our study was to evaluate the effect of the three surface treatments (namely, sandblasting, laser etching, and spark erosion) on the retention and resistance of partial veneer crowns. The null hypothesis stated that there is no difference between the three surface treatments. Currently, there is limited evidence in literature to provide any conclusive evidence on the effect of these surface treatments on longevity of partial veneer crowns. Thus, clinically, the findings from this study could help to improve the longevity of partial veneer crowns along with the added advantage of conservation of tooth structure. Ethical clearance was obtained from the Institutional Review Board (Approval No: SRMDC/IRB/2014/MDS/No. 206). Total of 90 extracted intact human maxillary first premolars, extracted for orthodontic treatment, were used in this study. Roots of the specimen were notched and embedded in auto-cured acrylic resin (DPI RR– Cold cure, Dental Products of India, Mumbai, India) blocks of size 15 mm × 15 mm × 25 mm [Figure 1]. Auto-cured resin was mixed in a ratio of 3:1 by volume, and the teeth were embedded such that the cementoenamel junction was above the resin by 1–2 mm. 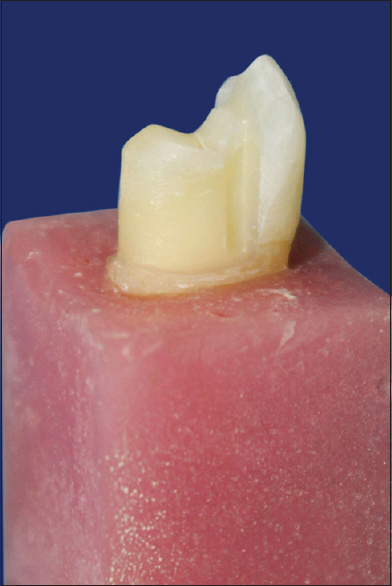 Conventional partial veneer crown preparation was done on all the embedded teeth using high speed handpiece and water coolant [Figure 2]. Putty index (Aquasil Soft Putty/Regular Set, Dentsply Detrey GmbH, Konstanz, Germany) of each tooth was made before tooth preparation. All the preparations were done by a single operator. Standard round end-tapered diamond bur (TR-13, Mani Inc., Utsunomiya, Tochigi, Japan) was used for occlusal reduction and functional cusp bevel. The clearance was 1.5 mm on the palatal cusp and 1.0 mm on facial cusp. Lingual preparation was done using a standard torpedo diamond bur (SO-21, Mani Inc., Utsunomiya, Tochigi, Japan). Proximal reduction was done using a standard needle-shaped diamond bur (TC-11, Mani Inc., Utsunomiya, Tochigi, Japan) and completed using standard torpedo diamond bur. Axial and proximal reductions were done to a depth of 1 mm resulting in a chamfer finish line 1 mm above the cementoenamel junction. The facial surface was left intact. Proximal retention grooves were placed using 169 L carbide bur (169-L, Mani Inc., Utsunomiya, Tochigi, Japan) to the depth of the bur. Occlusal offset was made to a depth of 1 mm using the same 169 L bur. Proximal flares and bevels were made using standard flame-shaped diamond bur (FO-11, Mani Inc., Utsunomiya, Tochigi, Japan). Preparations were finished using extra fine round end-tapered diamond (TR-25EF, Mani Inc., Utsunomiya, Tochigi, Japan). After preparation, the teeth were rinsed and cleaned with distilled water in an ultrasonic bath. All the samples used in the study were divided into three groups based on the type of surface treatment. Group A was samples to be treated by sandblasting alone, Group B was samples to be treated by sandblasting followed by laser etching, and Group C was samples to be treated by sandblasting followed by spark erosion. Each group consisted of two subgroups: Sub Group I -Retention test group, Sub Group II -Resistance test group. The prepared teeth were randomly allotted to the three groups using lot method in a ratio of 1:1:1 resulting in 30 samples per group. The lots were picked up by an individual who was not involved in the study. A similar lot method was followed to allot the teeth to either of the subgroups: Retention test group (Sub Group I) or resistance test group (Sub Group II) in an allocation ratio of 1:1 resulting in 15 samples in each subgroup. Individual dies were formed with type IV die stone (Elite Rock, Zhermack spa, Italy) for each prepared tooth for fabrication of direct wax patterns. Wax patterns (Crown wax hard, BEGO GmbH and Co. KG, Bremen, Germany) were immediately sprued, invested and cast using base metal alloy (Wiron 99, BEGO GmbH and Co. KG, Bremen, Germany). Castings in the retention test group were fabricated by attaching a 2.5 mm sprue wax (Wax sprue wire 2.5 mm, BEGO GmbH and Co. KG, Bremen, Germany) to the marginal ridges to produce a U-shaped loop to test retention [Figure 3]. The U-shaped loop provided the attachment for a hook for testing retention. Castings in the resistance test group were designed so that the crowns would have a fossa approximately 4 mm in diameter and 2 mm deep in the center of the crown to test resistance [Figure 4]. The fossa provided space to accommodate a steel ball to which the force for resistance is applied. Castings were recovered from the investments cleaned, finished with 400 and 800 grit finishing stones and were fit to the respective teeth. The fitting surfaces of all the samples were sandblasted with 100 μ aluminium oxide at a distance of 10 mm for 10 s at an air pressure of 70 psi followed by rinsing in ultrasonic bath for 15 s to remove excess aluminum oxide. Samples in Group A were subjected to sandblasting alone. Group B samples were sandblasted and subjected to laser etching using Nd:YAG laser (YAG Laser marking machine, SYD-60, Dongguan Kite Laser Technology Co., Ltd. Guangdong, China). The fitting surface of the copings was irradiated with a glass fiber of Nd:YAG laser with a power of 2kW, energy of 120 mJ and a frequency of 50 Hz for 5 s. The set of samples in Group C were sandblasted and subjected to spark erosion using electrical discharge machining (EDM) device (CNC EDM Machine, Model: CNC341s, Creator Industry– Suzhou Co., Ltd. Jiangsu, China). The castings were held in a holder in the machine and stabilized. A thin copper electrode was used as the spark erosion tip. Spark erosion was carried out with a potential of 90 kV and current of 0.5–1.5 A. A dielectric liquid was used as a coolant [Figure 5]a and [Figure 5]b. The electrode was moved manually using a control unit over all the fitting surface of the castings. After surface treatments, all castings were cleaned in an ultrasonic bath. The fit of the castings was verified on the tooth preparations using a stereomicroscope and only those castings which demonstrated marginal discrepancy within 0.1 mm (100 μm) were used for the study. The clinically acceptable marginal discrepancy of crowns ranges from 50 to 120 μm. Castings in each subgroup were luted with resin cement (Panavia F 2.0, Kuraray America, Inc., NY, USA) to their respective tooth preparations according to manufacturer's recommendations. Briefly, alloy primer liquid (Alloy Primer, Kuraray Noritake Dental Inc., Okayama, Japan) was applied on the fitting surface of the castings and dried for 30 s. The primer liquids (ED Primer II Liquid A and Liquid B, Kuraray Noritake Dental Inc., Okayama, Japan) were mixed and applied on the tooth surface for 30 s using small brushes and then air dried. An equal amount of Panavia paste A and B (Panavia F 2.0; Paste A and Paste B, Kuraray Noritake Dental Inc., Okayama, Japan) were mixed and applied on the inner surface of the castings and cemented on to the prepared teeth. The margins of the cemented castings were light cured (Blue Phase, Ivoclar Vivadent AG, Schaan, Principality of Liechtenstein) for 20 s and the excess cement was removed. Oxygen protecting gel (Oxyguard II, Kuraray Noritake Dental Inc., Okayama, Japan) was applied over the margins for complete curing of the resin cement. After the cement was set, all the test specimens were stored in a water bath at a 37°C for 24 h.
Retention and resistance testing of samples were done with the use of an Instron Universal testing machine (3382 Floor Model Universal Testing System, Instron industrial products, PA, USA). For testing of retention (Sub Group I of Groups A, B, C) a self-aligning apparatus attached to the crosshead of the Instron machine was connected to the U-loop of the crown, such that the long axis of the preparation was coincident with the path of removal [Figure 6]. The crowns were separated from the blocks at a cross-head rate of 0.5 mm/min and the tensile forces required for crown removal were recorded as retention value. Resistance to dislodgment (Sub Group II of Groups A, B, and C) was tested by applying a force in a direction oblique to the path of insertion [Figure 7]. The block with cemented casting was bolted onto a 45° ramp in a machined stabilizing block which was positioned and secured to the load cell of the Instron machine. A ball bearing 5/32 inch (4 mm) in diameter was placed in the fossa on the lingual cusp of the crown. A tapered steel stylus attached to the cross-sectional head of the machine was lowered into the position until a concave depression in its tip was firmly seated over the ball bearing. Shear force was applied at a cross-head rate of 0.5 mm/min until the crown was dislodged. The force was measured and recorded as resistance value. [Table 1] and [Figure 8], [Figure 9] shows the retention and resistance values (in Newtons) obtained for Groups A, B, and C, respectively. Values are as expressed as mean ± standard deviation. The data were checked for normality using Kolmogorov–Smirnov test and were found to be normally distributed. Hence, the data were statistically analyzed using one-way ANOVA [Table 2] followed by Tukey's Honest Significant Difference as a post hoc test [Table 3] using IBM SPSS Statistics for Windows (Version 19.0, IBM Corp., Armonk, NY, USA). Mean retention test values of Groups A, B, and C was 210.533 ± 19.35 N, 244.00 ± 29.871 N, and 270.00 ± 1.604 N, respectively. Mean resistance test values of Group A, B, and C were 592.73 ± 19.82 N, 619.20 ± 20.24 N, and 663.80 ± 27.33 N, respectively. The two surface treatments, laser etching and spark erosion (Groups B and C) of metal copings significantly improved the retention and resistance compared to sandblasted surfaces alone (P ≤ 0.05). Retention and resistance of copings which were sandblasted and spark eroded (Group C) were found to be highest among the three groups (P ≤ 0.05). 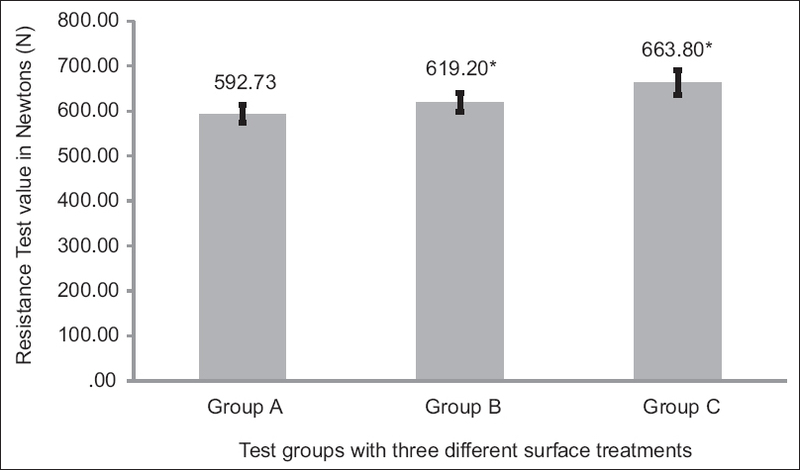 This study evaluated the retention and resistance of partial veneer crowns with different surface treatments (sandblasting, laser etching, and spark erosion). It has been established beyond doubt that retention and resistance are indispensable for success of extracoronal restorations such as complete and partial veneer crowns. Retention of crowns depends on the length, height, taper, surface area, and surface roughness of the preparations. 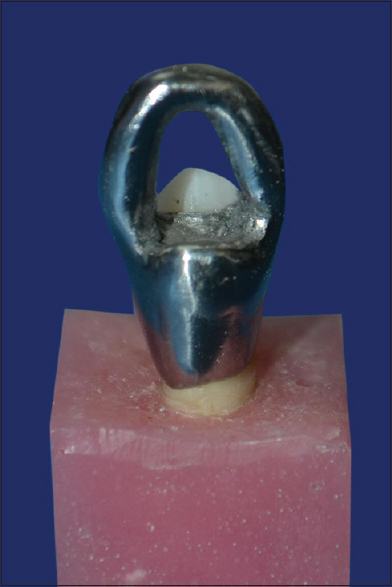 In contrast to retention, features of resistance are those that prevent the dislodgement of the prosthesis when the prosthesis is subjected to nonaxial forces., In our study, conventional preparation geometry to achieve retention and resistance for partial veneer crowns was incorporated, and all the samples were prepared by a single operator to minimize variations in preparation and human error. To minimize bias due to variation in height, length and surface area of the preparation, we allotted all the samples to the three groups randomly using a lot method as mentioned before. The luting cement was the same between all the samples. Thus, the variations seen in the results of retention and resistance testing from our study could be attributed purely to the effects of surface treatments and the resulting strength of metal-resin bonding. Retention and resistance of partial crowns could be improved either by changing the preparation geometry or by improving bonding of the restorations. In our study, we have focussed on methods to improve metal-resin bonding and adopted conventional geometric preparation for partial veneer crowns. 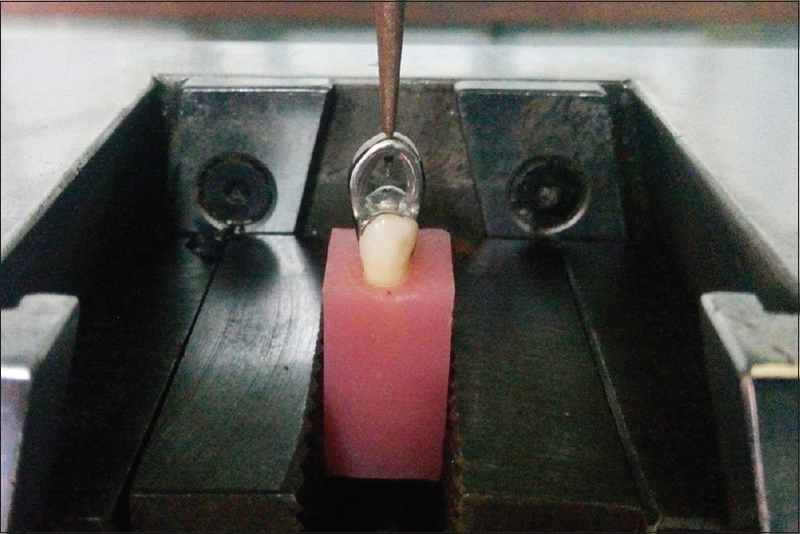 With improvements in resin systems, bond strengths of metal-resin-tooth have increased significantly leading to more predictable clinical outcomes., It has also been shown that micromechanical retentive features improve resin-metal bonding better than macromechanical features. In our study, we found that sandblasting followed by spark erosion or laser etching significantly improved the retention and resistance of partial veneer copings compared to sandblasted surfaces alone. Thus, our null hypothesis is rejected and the alternative hypothesis is chosen. We also found that among all the three surface treatments, sandblasted and spark eroded samples (Group C) had the maximum retention and resistance. 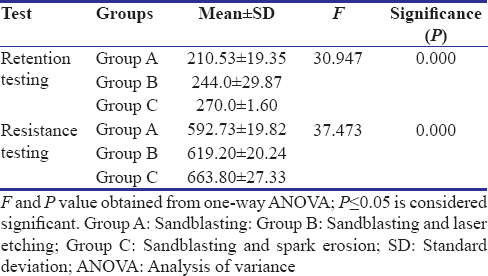 Group A (Sandblasting) samples showed lesser values for retention and resistance when compared to Group B (Laser) and Group C (Spark erosion). This could be because the surface irregularities created by sandblasting were lesser compared to spark erosion or laser etching. Another major complication of sandblasting is retention of alumina particles on the alloy surface. The presence of such embedded fragments adversely affects the retention and resistance of metal-resin systems, decreasing the mechanical interlocking. The micromorphological features of sandblasted surfaces are shown as shallow pits. Su et al. reviewed that increasing the sandblasting time and particle size (50 μ to 110 μ) has a positive influence on retention and resistance value. As a result of sandblasting, surface energy is lowered which promotes adhesion. Mukai et al. concluded that sandblasting with different particles sizes acts as an adjunct to resin cement to improve the shear bond strength for resin with alloy. Fonseca et al. showed variation in the grit size and applied pressure of alumina particles used in sandblasting can affect the irregularities caused on the alloy surface. Thus, the surface roughness and resulting metal-resin bond strength is dependent on the particle size, particle shape, particle speed, density of particles, duration of blasting, air pressure and distance between the source of the particles and the surface. The increase in retention and resistance for Group B samples may be due to the ability of high energy laser to produce surface undercuts and micro defects on the intaglio surface of the partial veneer which enhances micromechanical retention of resin. This feature of laser etched surface as opposed to a simple roughened surface produced by sandblasting is more favourable for metal resin bonding. Combination of laser etching with sandblasting increased the debond strengths. This emphasizes that there is a direct correlation between microroughness and retention-resistance. da Silveria et al. concluded that the laser irradiated ceramic surface was more effective due to the low surface energy and rough surface created by the laser beam. When a ceramic surface treated with Nd:YAG laser was observed under scanning electron microscope (SEM) (×200 magnification), the surface pattern showed areas which appeared molten with presence of pores and craters, droplets and grits, thereby increasing the surface undercuts which enhanced adhesion. On the other hand, the surface morphology with sandblasted area caused a rougher surface with irregularities without any discernable defect on the surface. Gorler and Ozdemir made a similar observation in nickel-chromium alloy surfaces treated with Nd:YAG laser. They concluded that during the laser energy discharge, surface changes were observed due to punctual action of laser micro explosion resulting in the formation of craters and pores. The deposition of spherical droplets is possibly due to the cast material nuggets close to the laser application point. All these features of a laser etched surface contribute to increase is retention due to micro mechanical undercuts. Surface irregularities can be more effectively created with help of the electrodes used in the spark erosion procedures. This process is based on thermoelectric energy between the work piece and an electrode. Here, the metal is removed by melting and vaporization in single sparks. When the voltage between the electrodes increases the erosion of the metal piece also fastens. Spark erosion or EDM has been commonly used in dentistry to improve the fit of implant prosthesis., This type of EDM uses a prefabricated electrode with a specific shape that is used to machine the workpiece accurately to specific dimensions. This process ensures precise fit. In our study, we have used a copper electrode instead of a prefabricated electrode as the configurations of the preparations vary with the size and shape of the natural tooth and hence a uniform electrode cannot be used for all the samples. This type of spark erosion uses a thin wire electrode which permits it to be used for complex shapes. Use of a wire electrode negates the need for fabrication of complex electrodes. 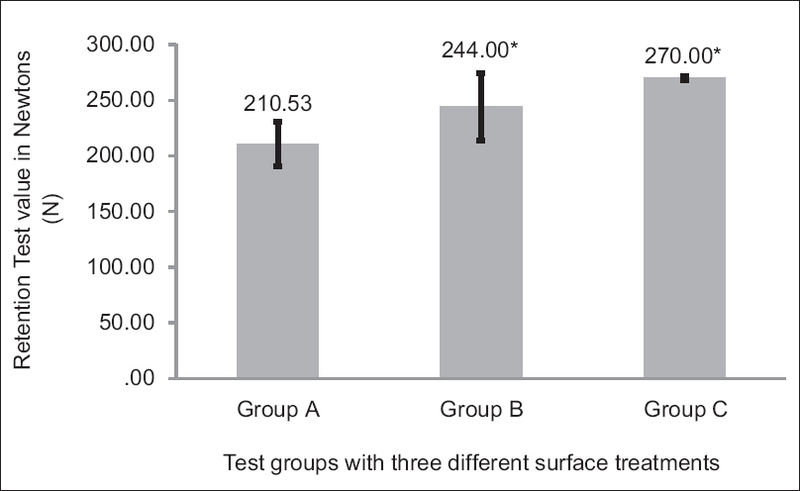 Group C samples treated with spark erosion had high values of retention and resistance (P < 0.001) compared to the other two groups. Observed results can be explained by the ability spark erosion process to improve the fit of a prosthesis and to induce surface changes/elemental alterations on the metal surfaces. Process of spark erosion is well known to produce dental restorations with improved fit. With the improvement in the fit of prosthesis, there is also an in increase in the retention and resistance of the prosthesis. Surface changes and elemental alterations caused by spark erosion process were studied by Zinelis. Metal surfaces treated by spark erosion were found to have a layer called as the “Recast Layer” which was formed due to melting, evaporation, and resolidification of the molecules on the surface of the metal. SEM analysis of the metal surfaces showed rough texture with amorphous interconnected islands (craters) and large number spherical pores. The large pores on the surface are created by the explosion and subsequent evaporation of the dielectric fluid during spark erosion. All these features improved the surface area and thus metal resin bonding. Janda et al. concluded that spark erosion is an effective method to improve metal resin bonding thus enhancing retention and resistance. Metal surfaces treated by spark erosion were also found to have an increased concentration of carbon and copper due to the decomposition of the dielectric fluid and the copper electrode, respectively. This also increased the surface hardness of the metals., Whether the incorporation of carbon/copper and subsequent hardening of the metal surface really plays a role improving metal-resin bonding is unclear and yet to be investigated. We did not calculate the surface area of each tooth preparation. We consider this as the limitation of our study. Any tool that helps in calculating the prepared tooth surface area would have made standardization better thus giving a more cleared picture of the effect of surface are to the strength of metal resin bonding. The potential of partial veneer crown is underestimated in clinical dentistry leading to numerous failures primarily due to lack of experience in tooth preparation and subsequent loss of retention. Combined with this, limited research focused on methods to improve clinical performance of partial crowns has led to a drastic decrease in its clinical use. More research and better training in clinical skills are the need of the hour which can exploit the benefits of conservation of tooth structure and clinical longevity offered by partial veneer crowns. This study was conducted with the objective of analyzing the retention and resistance of partial veneer crown with different surface treatment methods such as sandblasting, laser etching, and spark erosion. Within the limitation of this in vitro study, from the data received, it can be concluded that combination of spark erosion and sandblasting significantly improves the retention and resistance values of partial veneer crown. This study helps to provide a better knowledge about the surface treatment required for success of partial veneer crowns. It can be useful in restorations with less surface area and can act as better adjunct to provide a long-lasting restoration. Kahn AE. Partial versus full coverage. J Prosthet Dent 1960;10:167-78. Caplan J. Maintenance of full coverage fixed-abutment bridges. J Prosthet Dent 1955;5:852-4. Ruiz JL, Kurtz R. Are full-coverage crowns overutilized? Supragingival partial-coverage designs as a first option. Dent Today 2014;33:122, 124-5. Suzuki M, Jordan RE. Full or partial coverage – An aesthetic and functional dilemma. Ont Dent 1983;60:10-3. Shillingburg HT Jr., Fisher DW. A partial veneer restoration. Aust Dent J 1972;17:411-7. Pruden WH II. Partial coverage retainers: a critical evaluation. J Prosthet Dent 1966;16:545-8. Creugers NH, Käyser AF, van 't Hof MA. A meta-analysis of durability data on conventional fixed bridges. Community Dent Oral Epidemiol 1994;22:448-52. Sharma P. 90% of fixed partial dentures survive 5 years. How long do conventional fixed partial dentures (FPDs) survive and how frequently do complications occur? Evid Based Dent 2005;6:74-5. Tan K, Pjetursson BE, Lang NP, Chan ES. A systematic review of the survival and complication rates of fixed partial dentures (FPDs) after an observation period of at least 5 years. Clin Oral Implants Res 2004;15:654-66. Quinn F, Gratton DR, McConnell RJ. The performance of conventional, fixed bridgework, retained by partial coverage crowns. J Ir Dent Assoc 1995;41:6-9. Abt E. Survival rates for resin bonded bridges. Evid Based Dent 2008;9:20-1. Creugers NH, Snoek PA, van't Hof MA, Käyser AF. Clinical performance of resin-bonded bridges: A 5-year prospective study. I. Design of the study and influence of experimental variables. J Oral Rehabil 1989;16:427-36. Creugers NH, Käyser AF, Van't Hof MA. A seven-and-a-half-year survival study of resin-bonded bridges. J Dent Res 1992;71:1822-5. Pjetursson BE, Tan WC, Tan K, Brägger U, Zwahlen M, Lang NP, et al. A systematic review of the survival and complication rates of resin-bonded bridges after an observation period of at least 5 years. Clin Oral Implants Res 2008;19:131-41. Rochette AL. Attachment of a splint to enamel of lower anterior teeth. J Prosthet Dent 1973;30:418-23. Livaditis GJ, Thompson VP. 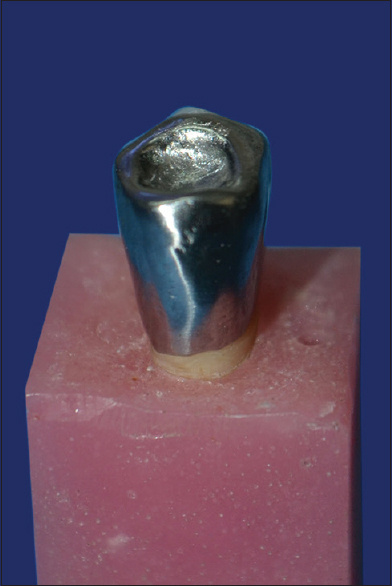 Etched castings: An improved retentive mechanism for resin-bonded retainers. J Prosthet Dent 1982;47:52-8. Livaditis GJ. 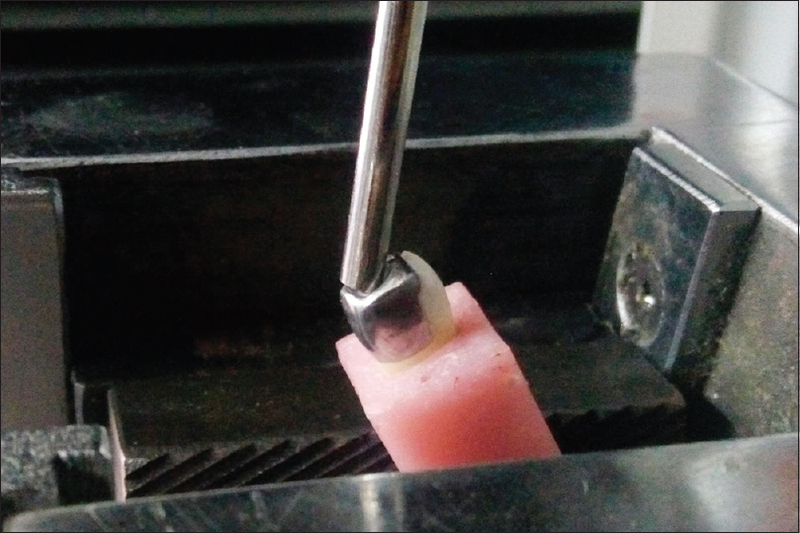 A chemical etching system for creating micromechanical retention in resin-bonded retainers. J Prosthet Dent 1986;56:181-8. Hudgins JL, Moon PC, Knap FJ. Particle-roughened resin-bonded retainers. J Prosthet Dent 1985;53:471-6. Brady T, Doukoudakis A, Rasmussen ST. Experimental comparison between perforated and etched-metal resin-bonded retainers. J Prosthet Dent 1985;54:361-5.
el-Sherif MH, el-Messery A, Halhoul MN. The effects of alloy surface treatments and resins on the retention of resin-bonded retainers. J Prosthet Dent 1991;65:782-6. Creugers NH, van't Hof MA, Vrijhoef MM. A clinical comparison of three types of resin-retained cast metal prostheses. J Prosthet Dent 1986;56:297-300. Murray AK, Attrill DC, Dickinson MR. The effects of xeCl laser etching of ni-cr alloy on bond strengths to composite resin: A comparison with sandblasting procedures. Dent Mater 2005;21:538-44. Weber H, Frank G. Spark erosion procedure: A method for extensive combined fixed and removable prosthodontic care. J Prosthet Dent 1993;69:222-7. Eisenmann E, Mokabberi A, Walter MH, Freesmeyer WB. Improving the fit of implant-supported superstructures using the spark erosion technique. Int J Oral Maxillofac Implants 2004;19:810-8. Schmitt SM. Spark erosion for precise fitting of implant retained restorations. J Dent Technol 1998;15:15-9. Deepak K, Ahila SC, Muthukumar B, Vasanthkumar M. Comparative evaluation of effect of laser on shear bond strength of ceramic bonded with two base metal alloys: An in-vitro study. Indian J Dent Res 2013;24:610-5. Zinelis S. Surface and elemental alterations of dental alloys induced by electro discharge machining (EDM). Dent Mater 2007;23:601-7. Owen CP. Retention and resistance in preparations for extracoronal restorations. Part I: Theoretic studies. J Prosthet Dent 1986;56:13-6. Owen CP. Retention and resistance in preparations for extracoronal restorations. Part II: Practical and clinical studies. J Prosthet Dent 1986;56:148-53. Hill EE. Dental cements for definitive luting: A review and practical clinical considerations. Dent Clin North Am 2007;51:643-58, vi. Krämer N, Lohbauer U, Frankenberger R. Adhesive luting of indirect restorations. Am J Dent 2000;13:60D-76D. Kern M, Thompson VP. Sandblasting and silica-coating of dental alloys: Volume loss, morphology and changes in the surface composition. Dent Mater 1993;9:151-61. Su N, Yue L, Liao Y, Liu W, Zhang H, Li X, et al. The effect of various sandblasting conditions on surface changes of dental zirconia and shear bond strength between zirconia core and indirect composite resin. J Adv Prosthodont 2015;7:214-23. Mukai M, Fukui H, Hasegawa J. Relationship between sandblasting and composite resin-alloy bond strength by a silica coating. J Prosthet Dent 1995;74:151-5. Fonseca RG, Martins SB, de Oliveira Abi-Rached F, Dos Santos Cruz CA. Effect of different airborne-particle abrasion/bonding agent combinations on the bond strength of a resin cement to a base metal alloy. J Prosthet Dent 2012;108:316-23.
da Silveira BL, Paglia A, Burnett LH, Shinkai RS, Eduardo Cde P, Spohr AM, et al. Micro-tensile bond strength between a resin cement and an aluminous ceramic treated with nd: YAG laser, rocatec system, or aluminum oxide sandblasting. Photomed Laser Surg 2005;23:543-8. Gorler O, Ozdemir AK. Bonding strength of ceromer with direct laser sintered, Ni-Cr-based, and ZrO2 metal infrastructures after Er: YAG, Nd: YAG, and Ho: YAG laser surface treatments – A comparative in vitro study. Photomed Laser Surg 2016;34:355-62. Ho K, Newman S, Rahimifard S, Allen R. State of the art in wire electrical discharge machining (WEDM). Int J Mach Tools Manuf 2004;44:1247-59. Janda R, Roulet JF, Latta M, Damerau G. Spark erosion as a metal-resin bonding system. Dent Mater 2007;23:193-7. Simao J, Lee H, Aspinwall D, Dewes R, Aspinwall E. Workpiece surface modification using electrical discharge machining. Int J Mach Tools Manuf 2003;43:121-8. Chen SL, Yan BH, Huang FY. Influence of kerosene and distilled water as dielectrics on the electric discharge machining characteristics of Ti–6A1–4V. J Mater Process Technol 1999;87:107-11.